Over in content corner at GOV.UK, we’re spending 20% of our time improving content beyond our reactive ‘business as usual’ work. I've been looking at the Standard Visitor visa guide. In this example, we deliberately picked a single and successful route through the website, largely for simplicity. There are other ways users might find this content, maybe through different search terms, other pages on GOV.UK or following a link they’ve been given. I started by putting myself in the shoes of someone planning to come to the UK for the first time, not knowing they'd need a visa to visit. By googling “I’m travelling to UK, what do I need?”, I find our ‘Check if you need a UK visa’ content. Depending on how I answer the questions about my country of origin and reason for visiting the UK, I'm told one of 3 possible things - I need to apply for a visa, I don’t need to apply for a visa, or I might need to apply for a visa. 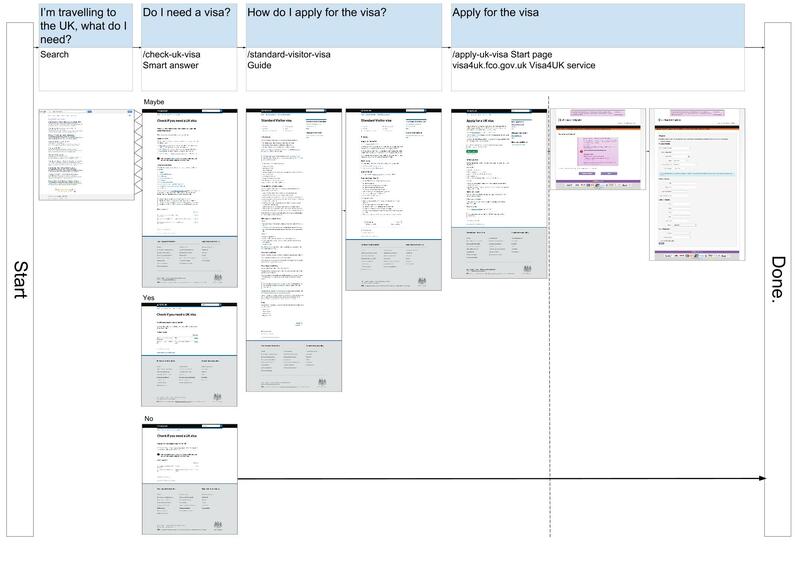 I’m then led to read one or more visa guides, before getting to the Apply for a UK visa start page, which whisks the user off to UKVI's ‘Visa4UK’ visa application service. With this journey mapped, I set up a ‘closed funnel’ in Google Analytics to see how many users are getting through it. We can only track users up until the start page at the moment, so we can’t see exactly how many then go on to UKVI, but we should be able to track external link clicks soon. This closed funnel gives us a benchmark figure to measure our work against, and gives us a starting point to compare other user journeys to. Usually, a higher percentage of completions is a good thing, but that isn't always the case. For example, we might find out that 0.33% is exactly the amount of users that should be getting through to the end. Taking a step back and looking at content in a specific context is incredibly insightful. The objectivity you gain from this exercise helps test its suitability, and hopefully leads you to come up with some improvements. What do you have for lunch though? I usually make a sandwich for lunch. At the moment I've got turkey, iceberg lettuce, mayo and brie. However, I'm not entirely convinced having the brie in there works. Would be good to understand how you created the "closed funnel"? Gather you somehow tweaked ecommerce features? We created a custom report using the beta funnel functionality. 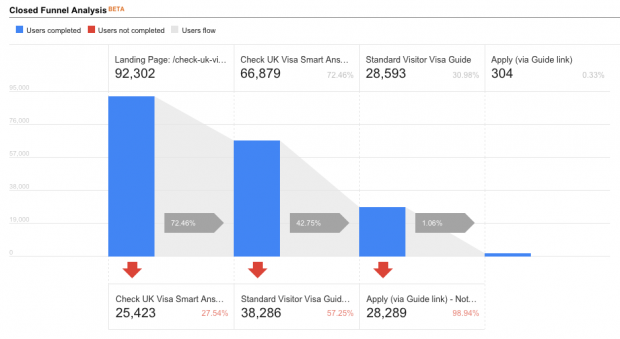 There's a short guide to creating custom funnels on the Google Analytics help website. "do some A/B testing where we send 50% of the users directly to the start page once we know they need a visa, and send the other 50% to read the guide first"
How about redesign the start page / create a page so that it allows you to start the application but also includes (links to) the guidance. Then LET the user decide! !